In the summer of 2018, I interned as a Product Designer at Udacity, an online learning platform offering higher education opportunities relevant to the digital economy. I worked in close proximity with a Senior Designer to explore “Progress” as a concept and how it could fit into Udacity’s existing product. My responsibilities included UX design, UX research, visual design, and interactive prototyping. 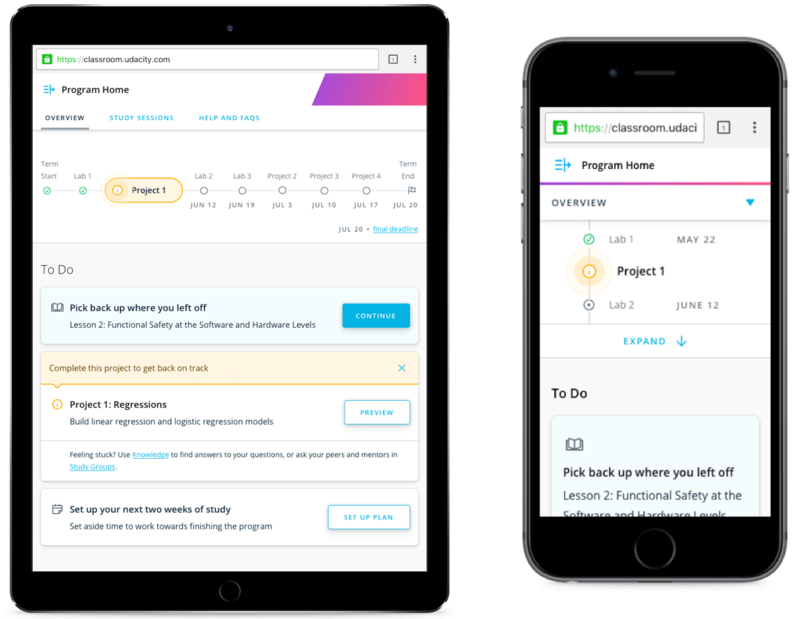 I worked within Udacity’s in-house design team as part of the cross-functional Classroom team alongside other designers, PMs, researchers, and developers. 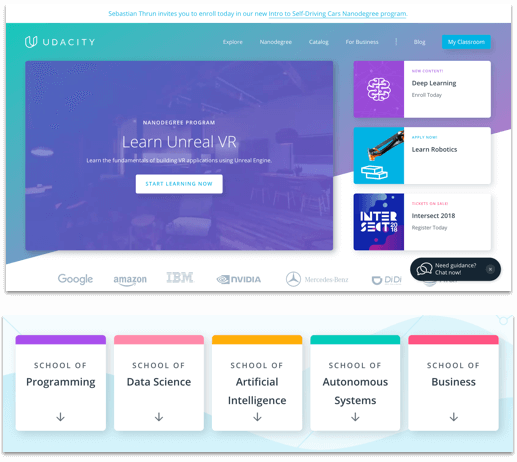 Udacity’s mission is to democratize education through the offering of world-class higher education opportunities that are accessible, flexible, and economical. Udacity’s equivalent to degrees are called Nanodegrees (NDs for short). 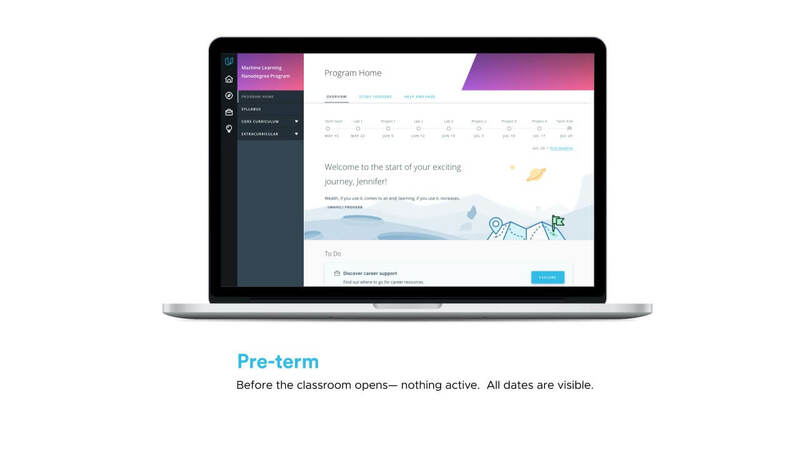 How can Progress be used to motivate and inspire Udacity students in the Classroom? A majority of my time was spent on designing and developing Progress in the context of Udacity’s upcoming feature, Nanodegree Home (explained below). We had the luxury of multiple rounds of user testing, which meant lots of room for iteration and improvement. I then spent a last couple weeks of my time conducting more exploratory, research-based exercises to explore future directions— Progress 2.0. Students want to have clear next steps and a view of their progress. ND Home is a central hub that simplifies and informs. Because Progress is a component of ND Home and not a standalone feature, I kept in mind the context and collaborated closely with the Senior Designer who owned the overall Nanodegree Home (ND Home for short) product throughout the design process. I conducted an analysis of the current Udacity product and identified the different ways students see their progress. The measures are placed along a scale of functional (easy to measure, quantifiable) to motivational (more conceptual, harder to quantify). * An ML derived number intended as a measure of a student’s likeliness to complete and graduate their Nanodegree. 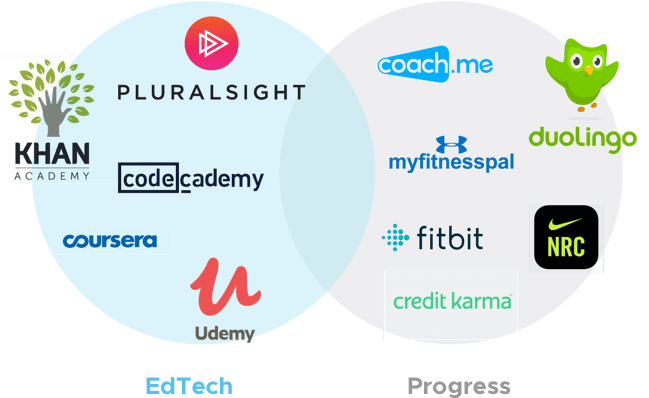 I looked into how direct competitors in the EdTech sphere visualize progress in their products, and how progress is represented in other sectors outside of education. Based on research findings, I started off with low-fidelity sketches. Design considerations I kept in mind included: Udacity’s learning model, immediate user needs, and time constraints for the shipping of ND Home. We decided to tackle the most quantifiable measure of Progress and the most immediate user need: Graduation Requirements. Based off both user feedback and stakeholder input, these iterations are a sample of the total scope of work produced throughout multiple rounds of user testing. Flexibility: Udacity offers 30+ Nanodegrees in a variety of technical disciplines, all with different graduation requirements. The final design should account for these differences and be flexible enough to accomodate for all of them. Balance: There must be a balance between giving the student too much and too little information. Too much and we risk overwhelming the student and losing important information in the midst, too little and we risk confusing them. Transparency: The design of Progress should clearly convey the student’s current status in their ND— are they on track? It should alert the student when needed and motivate at other times. The timeline changes chronologically, showing subtle indications of where the student is in their program and how they are performing. Below the timeline in the form of cards is a list of actionable items on which the student can take action to further their movement along the timeline. The design scales across tablet and mobile breakpoints. At the mobile breakpoint, the timeline breaks into its vertical version. Students can choose to expand the timeline to see the full list of graduation requirements. I spent the remainder of my time conducting more exploratory, research-based exercises to explore future directions. 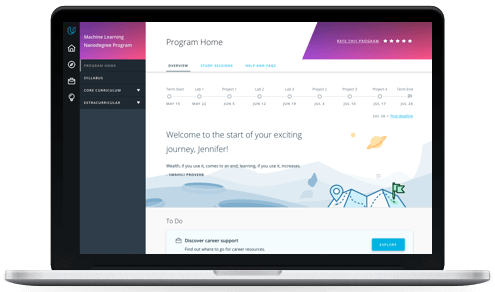 I conducted research in the form of user interviews alongside the team’s User Researcher to hear directly from current students on how they define personal progression and their motivations behind enrolling with Udacity. According to the high-level insights gained from the user interviews, students consider the best measure of Progress as the acquisition/development of skills and their ability to apply those skills to the real world.